Last weekend typhoon ‘Ondoy’ attacked Metro Manila and left it with destroyed properties and injured inhabitants. 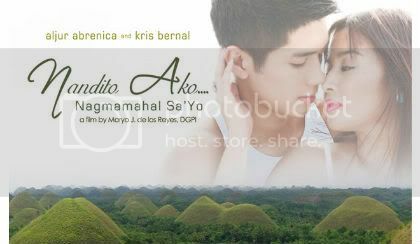 Starstruck loveteam Aljur Abrenica and Kris Bernal were addition to those devastated by the onslaught as their film ‘Nandito Ako’ flops the Box Office on its opening week. According to reports, the romantic-comedy film had a bad launching last Wednesday. Apparently, the Aljur-Kris movie seems to have a bad luck as another super typhoon, ‘Pepeng’ came to the Philippines this Friday. The blame shouldn’t be put to ‘Ondoy’ or to the loveteam. It may be a lack of foresight on the part of production management that resulted to unsuccessful turn of events. If the launching was postponed, the movie may had a favorable ‘good’ opening week.